Technical implementation of Halotherapy | Prof. Alina V. Chervinskaya, M.D., Ph.D. The most advanced method of treatment with the help of salt aerosol is the Controlled Halotherapy. Controlled Halotherapy ensures the establishment and sustaining all necessary parameters, differential dosing and control over the level of salt aerosol in the course of a treatment procedure. Generation, dosing of dry salt aerosol and control over aerosol environment are provided by the dosing halogenerators equipped with concentration sensors. Natural salt grinding is executed right inside the devices, and derived salt particles acquire high surface energy. Dry salt particles are picked up by an air flow generated inside the halogenerators; after that are separated and supplied by the air stream through a duct into the salt therapy room. The inbound sodium chloride aerosol contains mostly the respirable particles (80% at least). Halogenerators’ design enables setting of different levels and ranges of dry salt aerosol concentrations within limits from 0.5 to 11 mg/m³ (several modes of concentration are recommended for various groups of patients under the method of Controlled Halotherapy). The level of aerosol concentration is constantly checked. The aerosol environment is exceptionally agile and fast responsive to various factors (number of patients in a room, their respiratory volumes, current temperature, humidity, air velocity, etc.). That’s why a sensor shall be installed in a salt room for continuous monitoring of mass aerosol concentration. To maintain the microclimate parameters, a feedback system is used. 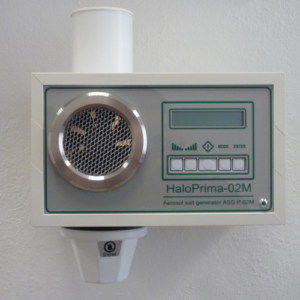 Halogenerators’ microprocessor processes the signals from a probe and sustains a required salt aerosol concentration, automatically adjusting to varying conditions in a room. 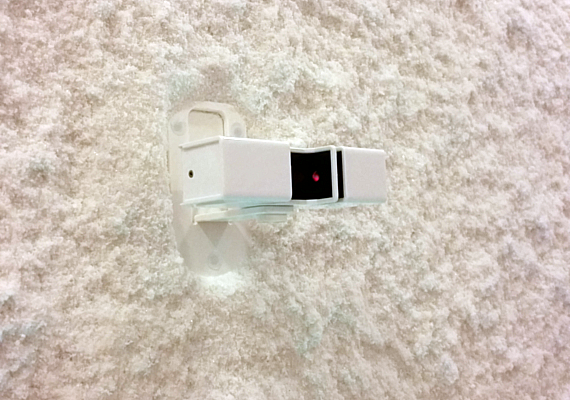 A microprocessor unit can also provide control of lighting and ventilation. In a treatment room, a microclimate with temperatures 20-24ºC and humidity 40-60% is sustained. No unique substances are required for the generation of dry salt aerosol – an edible salt (without iodine additives and anti-caking agents) or chemically pure pharmaceutical salt is used. This salt has a permanent consistency and a small share of premixes. The walls can be covered with salt mostly for aesthetic purpose. The walls coated with salt also help to absorb sound, sustain the temperature, humidity and atmospheric hypo-bacterial environment in interaction with salt aerosol.